La Cala is situated at the top of the Mijas valley, and was designed ground-up as a large self-contained holiday resort and residential urbanisation. Apart from the 3 full 18-hole golf courses, it has lots of activities – tennis, spa, running routes, horse-riding etc. The clubhouse is large, split over 3 levels, open-plan and modern architecture. I think it attractive and nicely done. Surrounding the club there is plenty of property for sale. There is no detriment here whatsoever for the golf. Clearly they are keeping standards up and the 'resort' aspect is working well e.g. there are groups coming in on '5 nights, 4 rounds of golf' type deals – at prices that when I asked about I thought very reasonable indeed. 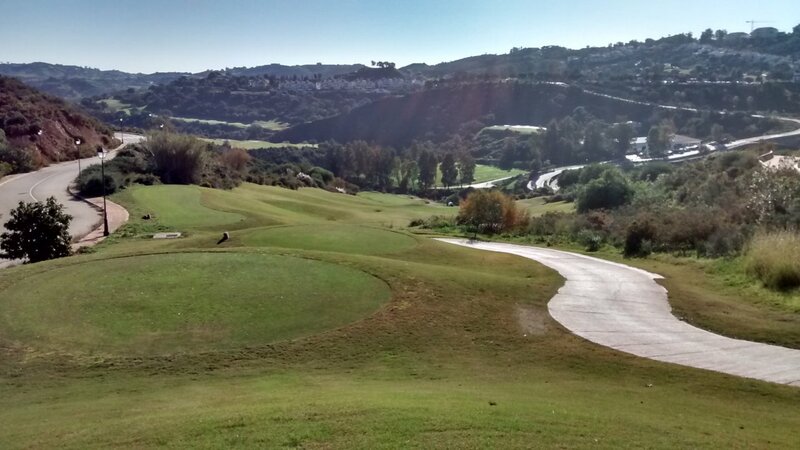 The clubs and courses in the Mijas valley do live in their own little world to a degree e.g. the only town some visitors go to is Mijas Costa (a pleasant little town at the bottom of the valley) – they never venture as far West as Marbella. So La Cala is the top-end of the Mijas area. 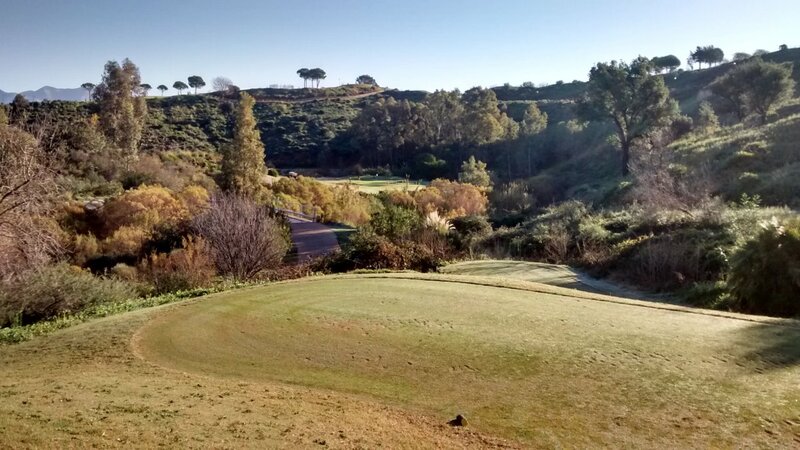 In that area there are enough golf and other activities to keep people happy – and self-contained in Mijas if that is what they want. 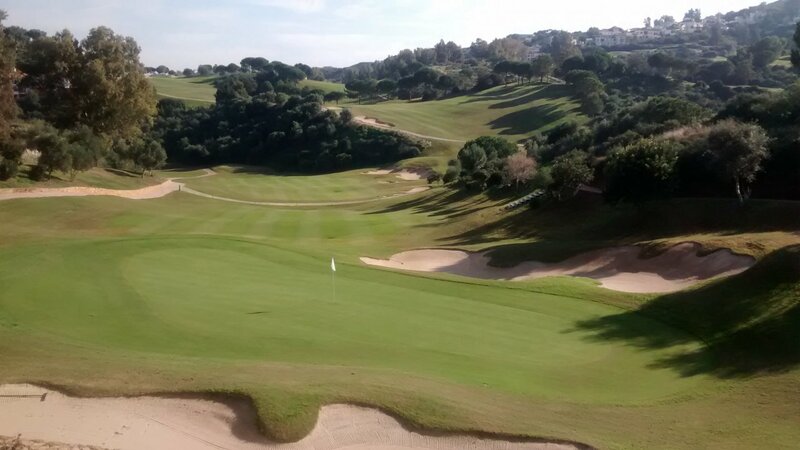 The 3 golf courses at La Cala are spread over a wide area. None of the courses is really suitable for walking. The club generally prefers you to take a buggy to keep up the rate of play. The original landscape was very diverse, mostly hilly. So the construction of the courses was a big deal. Lots of building effort and money. On balance I think they did a very good job of it. The courses are all sensitively set into the landscape, the holes blend in nicely and are generally very scenic and well thought out. There are no obvious compromises anywhere, and they still managed to split the courses about 50/50 (50% golf course, 50% surrounding wild areas). This means that wild shots missing fairways can often be in deep trouble – in a stream, far down a small ravine, up a steep hillside with dense undergrowth etc. This is genuine rough. But overall the fairways are moderately wide – not really narrow enough to be a serious concern to an average golfer. None of the golf courses at La Cala want to be championship level, because that would blow away the typical golfer who stays at or day-trips to this resort. The greens are quite large and moderately sloped. Green surrounds – in this case up to 3 meters off the green – are high-quality soft grass. The fairway grass is very consistent and the right type and quality for such a large inland area. The fairways are quite hard and fast - it is easy for a ball to get a lot of roll. The course they built last, and still in the best condition. This course is the most up-and-down of the 3 courses. Several holes have elevation tee-to-green of more than 10 meters. The holes are nicely varied. The 5 par 3s for example are all completely different from each other. There are high-quality and accurate cast aluminium hole maps mounted on sandstone on each tee. I thought as a 15-handicap player that most long holes were good for taking my driver off the tee. In other words, there were only 2 holes where I was taking a lesser, safer club off the tee. About half the fairways have significant slope (across the fairway) and there are often bunkers placed to catch a ball that fails to take enough 'high line' off the tee. But these are not killer bunkers. Not deep, very little bunker lip, fairly coarse sand but good quality. Greens quite fast, so a high-handicap golfer might struggle initially to realise that most downhill putts are little more than a tap, while uphill putts from distance need a good hit. I find the greens on this course very challenging. Hard to read the line of a putt. I watch playing partners also struggling to get the putts right, frequently shaving the hole or easily sliding a putt 1 to 2 meters past the hole then narrowly missing the return putt. Best advice: Take your time with the putts here – these greens are genuinely difficult. A course that swoops up and down with some significant doglegs. This course is most like other mid-level courses on the Costa Del Sol (like Almenara, La Cañada, Marbella Club and Santa Maria for example). Not difficult, with good-width fairways. Here there are no hole maps on most tee boxes (why not !). A slightly easier course than Europa, but still a good challenge. As a mid-handicap player, I was comfortable taking a driver off all par 4 and par 5 tees. Greens medium-paced. An attractive course to look at with lots of variety. Quite a lot of pitching and chipping up onto flat greens, so getting your distance on those approach shots is essential. If you get that right, up-and-down on most holes is achievable. The course they built first. The most worn of the courses, but still in good condition. There are accurate printed plastic hole maps on every tee. The first 9 holes are tight and some have severe slope (across the fairway). But generally the slope will take your ball into a safe area (not straight into rough) where you can still get a shot. The second 9 holes are better – more open, more variety, simply more fun. A number of holes are bowl-shaped, so offline shots tend to roll back towards the center of the fairway. Average length of the par 4s and 5s on the front 9 is 340 meters, on the back 9 it is 360 meters. So not a long course, but definitely not easy. Good golfers only really need to take a driver off the tee on about 4 holes. There are not many bunkers and they are not difficult to avoid. The whole La Cala experience is very organised. The staff (mostly British and Spanish) I always found courteous and helpful. The quality of the golf courses is definitely up to the standard of their main business – medium-level golfers on a self-contained 'golf holiday break'. I personally like the America course best because it is the style of course I play regularly down on the Costa del Sol. Europa is more diverse and more of a challenge – a greater mix of easy and tough holes. Europa is the most complex and arguably the best design of the 3 courses. Asia is quite unique. A good course for accuracy – which is no bad thing. The prices at La Cala can be very reasonable and good value-for-money, but I expect will rise quite a bit in high season. They will typically have all sorts of deals going (complex pricing) so well worth calling up and asking about that before you arrive. None of the courses are flat enough to be suitable for novice golfers. All are perfect for 15-25 handicap players, with Europa probably the best course for the big hitters. Only one thing counts against this club for visitors to the Costa del Sol. The location. It is a bit of a journey from say Marbella all the way up to the top of the Mijas valley. That distance certainly does not worry me. But some golfers are simply lazier in terms of how much they will travel. A pity – because La Cala offers fine golf. Certainly in my view a better round and more consistent quality than the other courses in the Mijas valley for the average golfer. Recommended. Review last updated: January 2015. Number of times played: 4 (all 3 courses). For the La Cala courses: Asia is represented by the brown dot bottom left, Europa by the light blue dot top right, América by the yellow dot between those two. This basically shows that Europa and América are about the same length with Europa marginally more difficult: Asia is both shorter and easier than Europa and América. An 18-handicap player can expect to go around these courses over par as follows: Asia - 17 over par; América - 20 over par; Europa - between 20 and 21 over par.